Outstanding model and photography, congrats! Airfix 1/48 Sea Fury Egyptian Service.. Very nice Sea Fury, congrats. Great news, although a costly kit I surely would like to make a Portuguese AF P2V-5 Neptune. 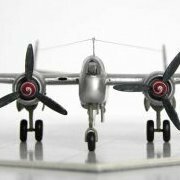 1/48 - Hawker Tempest by Eduard - 2016 release? Hi, In additon to the above mentioned "goodies", Eduard will also release a Brassin Napier Sabre and HGW has released a "Wet Transfer" version of the series 2 "Profipack" decals plus stencils, happy times for Tempest aficionados! Hi all, Eduard has announced 6 sets for the Airfix Hunter kit, available in April according with the Hannants website. Bought two of them this Friday at the LHS. Outstanding modelling in 1/72, congrats! Congrats for the first RFI Airfix Hunter and very nice model! Hi Salmo, Great WIP thread, I've just ordered from Eduard the series 2 kit and I will try to follow your advice on painting and weathering, thanks for sharing your work with us. Hi all, Why there is no kit review in Britmodeller yet?